when you subscribe to Adairs news & offers*. You will receive your $10 voucher via email shortly. Subscribe > to news, deals & offers. Create an account > save your details and speed up your shopping. Login > to update your details and fast checkout. Join Linen Lovers › to save 5% off sale and 10% off full price items. You must select a product to add to the cart. You must select a product to add to the wishlist. Wipe with a soft cloth. Please login to write a review of this product. The transaction was easy and delivery quick. It is very important to us that you love your purchase. If it’s not quite right, you can return most items (exceptions outlined below) within 30 days, or if the product is faulty, simply return the product to our online team or to one of our stores, along with a proof of purchase, for a refund or exchange. *Custom furniture. Due to the individual specifications of each custom piece, we unfortunately do not offer cancellations, returns or exchanges for a change of mind. Should an item be deemed faulty or damaged, we will provide a replacement, exchange or refund. Please note: anticipated lead times are 12 to 14 weeks for any custom order or custom replacement order. *Some items including quilts, underblankets and pillows cannot be returned, replaced or refunded due to health reasons, unless the product is faulty. Shipping fees are non-refundable. Contact our online team on 1300 783 005 to arrange delivery back to Adairs. In some cases you may also be able to return the item yourself to selected stores. This can be arranged with our customer service team, but not all stores can accept furniture returns due to space restrictions. Please note: If you are returning the item because it is not quite right a fee will be charged for the cost of delivery back to Adairs. Of course, if the item is faulty you will not be charged this fee. Find out more on our Satisfaction Guarantee page. If there is something you can't find here, then please get in touch by calling our Customer Service Team on 1300 783 005, emailing info@adairs.com.au, or find us on Facebook. Our standard flat rate for shipping within Australia is $9.95. Purchases of $150 or over will be shipped free of charge within Australia. The standard rate for oversized delivery items varies from $20 - $80 depending on the item and quantity of items in your order. Delivery fees are calculated at checkout. Free shipping promotions do not apply to oversized delivery items which include most furniture, some rugs and larger homewares pieces. Adairs uses third parties for delivery of any larger items outside Australia Post guidelines. You will be contacted by our delivery partners customer care team when your order arrives at their location in your state to arrange a suitable date and time. Deliveries are made Monday to Friday, between 9am and 6pm (Public holidays excepted). Please note: Standard delivery includes delivery to the ground floor door of your building. Due to OH&S policies, the delivery driver is unable to enter your home and the product is not able to be taken upstairs without assistance. If you need help getting the item up stairs or into your home etc. you will need to arrange this with our customer service team and additional fees will apply. 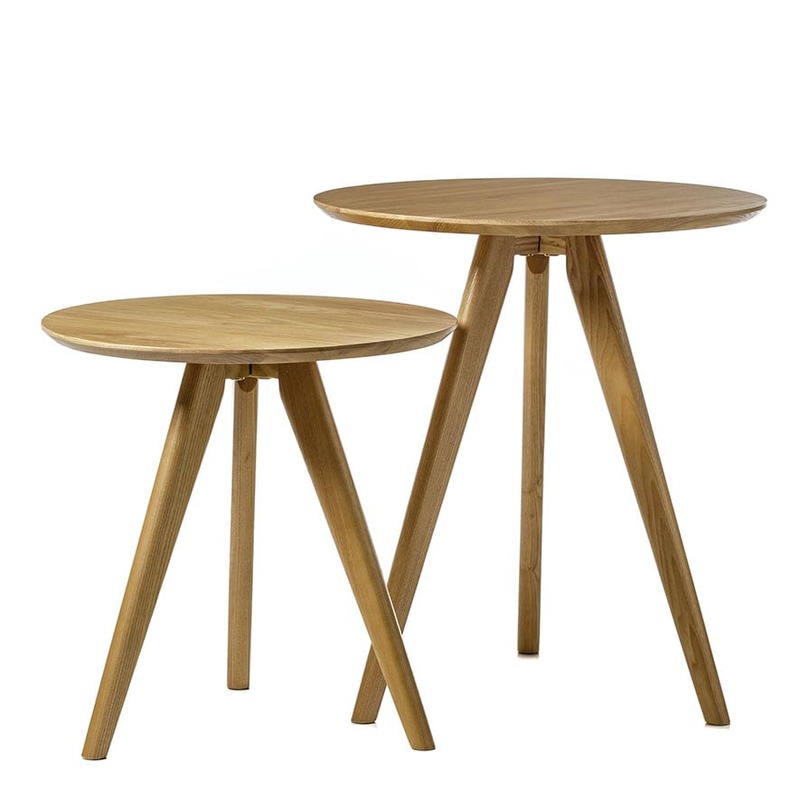 Beautiful solid timber has been used to create these tripod side tables, perfect for a modern decor. Inspired by northern Scandinavian design, the set of 2 look great together or individually around the home. What is Linen Lovers Pricing? Members of the Adairs Linen Lovers program receive 10% off full price items and 5% off sale items. Linen Lovers price includes this discount automatically. I'm a member. How do I receive the Linen Lovers discount? If you are a current Linen Lovers member you can add your membership number during the checkout process. Alternatively you can pair your Linen Lovers membership with an online account to receive your discount automatically when you're logged in. I'm not a current member. How do I receive the Linen Lovers price? You can become a Linen Lover online or in-store. Simply find out more information about joining our program today. © Adairs 2019 - Australia's leading independent retailer for manchester including bedroom, bathroom, homewares, furniture and kids.